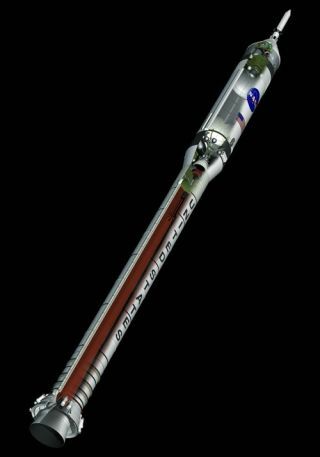 CAPECANAVERAL, Fla.– NASA’s next rockets to reach towards the Moon and Marsfinally have a name: Ares. NASAofficially unveiled the monikers Ares 1 and Ares 5 for the rockets that willboost future astronauts and heavy cargo into space Friday, one day before theDiscovery shuttle is setto launch into orbit. But afteran in-house study, NASA officially settled on Ares based on the name’sMars-related connotations, for the two rockets of its Project Constellationspacecraft. The first test flight an Ares booster could by 2009, with a pilotedtest to follow by 2014, NASA said. The Ares 1,consisting of an upper stage atop a five-segmented solid rocket booster thatwas originally developed for the shuttle program, will serve as NASA’sCrew Launch Vehicle. It will launch the four-to-six astronaut (CEV) Crew ExplorationVehicle, a 25-ton capsule-based spacecraft designed to ferry astronauts to theISS and Moon. LockheedMartin and ajoint team from Northrop Grumman and Boeing are competing to buildthe CEV for NASA, with an initial decision expected by September. The Ares 5,borrowing the number of NASA’s historic Saturn 5 Moon rocket, will serveas the Cargo Launch Vehicle, and is capable of boosting a 45-ton lunar lander and a rocket stage to ferry the landerand CEV to the Moon. Ares 5 willlaunch using two five-segment solid rocket boosters and a cluster of J-2Xengines – one of which is used in the Ares 1 upper stage – thatwill be derived from the original J-2 engine used in NASA’s Apollo Moonmissions. JeffHanley, NASA’s Project Constellation program manager, said the Aresvehicles are looking to launch from one of the two launch sites at KSC’s Pad 39 complex, though that target is verypreliminary. NASA’sspace shuttle Discovery is currently poised atop Pad 39B for its July 1 launch. William Gerstenmaier, NASA associated administrator for spaceoperations, said the Constellation program will likely borrow one of theshuttle program’s massive crawler carriers to move Ares rockets to andfrom their launch pad. Thecarriers were originally developed for the Apollo program to transport Saturn 5rockets, and were later modified to carry the space shuttle launch stack.